Safes are, by far, some of the best places to store important and even dangerous items. This is why they’re important must-haves for lots of households, especially the ones with guns. However, they’re also some of the most challenging things to add to any home. This is why I have decided to do a SnapSafe review. Most gun enthusiasts will know that SnapSafe products offer an alternative to the bulk and heft of traditional safes. Their modular design makes them a major hit among those who are looking for more adaptable methods of keeping their belongings safe. If you’re one of these folks who are having a hard time finding a suitable safe for your home, learning more about SnapSafe might be beneficial to you. Stick around and you might just find the info you need on this brand to help you make a good call. 4 Where are SnapSafe Safes Made? 5 Where are SnapSafe Safes Made? Some people believe that the most secure place to put a safe is somewhere no one can easily find it. The concealment can add further protection to the most important items you want to guard. If this is what you want to have at home, then you might want to check out the SnapSafe In Wall Safe. Designed to be easily mounted in between two wall studs with a 14 ¾” space in the middle, all you need to set this safe up are six lag bolts that are also included in the package. You can place it anywhere around the house as long as it fits. You can place it inside a built-in closet or even any wall as it’s quite easy to hide behind clothes, curtains, or wall hangings. It’s designed to sit flat on your wall, so unless it wasn’t installed properly, its position shouldn’t be given away easily. 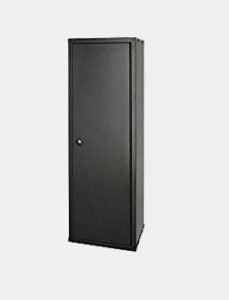 Like other SnapSafe products, the In Wall Safe is made with 16 gauge steel body. This guarantees that it’s very heavy duty. It’s also a good guarantee that it won’t easily bend under pressure. Most people also like that it comes with a key backup aside from its electronic lock. This can help further secure your belongings inside since anyone who wants access will need a key to get in. In the market for something that will help you sleep soundly at night? 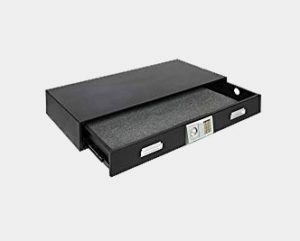 The 75400 SnapSafe Under Bed Safe might just do the trick for you. This safe is designed to sit under your bed, so it’s always within reach during emergencies in the middle of the night while still being tucked away from sight. With its size, it can easily hold your long firearms, other large weapons, and a lot of valuables. What makes the SnapSafe 75400 a great choice for a lot of people is that they don’t require installation. Its low profile allows it to be stashed away under stuff, so you don’t have to drill and hack open any part of your home. It’s also very heavy at nearly 150 lbs, so if you fill it up with weapons and additional items, it will then be very hard to move. While you can still secure it to the floor or your bedframe, it’s definitely not a must. 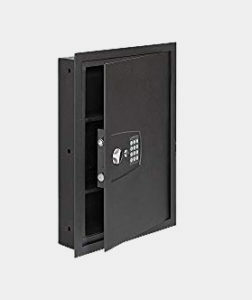 Constructed with a 14-gauge, heavy-duty steel, it guarantees a secure protection of your valuables. It also comes with a key lock aside from the electronic system to add more security to the system. In my experience, there are tons of reasons to get a high-quality portable safe with you everywhere. It can keep your important documents and valuables safely tucked away but still within your vehicle, person, or luggage. It can also be a good way to store a small firearm in many occasions. 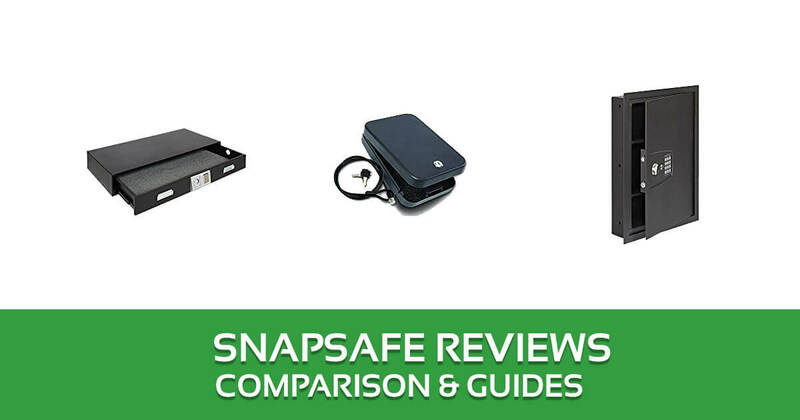 This is why I also made a point to add a SnapSafe lockbox review in this roundup. The SnapSafe 2-Pack Keyed Alike Lock Boxes are some of the bestsellers from the brand for a good reason. For one, they’re very handy. Designed to fit most small handguns and other valuables, this SnapSafe Lock Box is also TSA and airline approved. 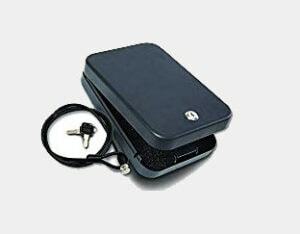 You can take them with you anywhere and you can rest assured that your items are secured nicely. Being a SnapSafe product, it also comes with the promise of great quality. Made from 18 gauge steel, a secure key lock, and a well-designed piano hinge, this product can be your best protection against thieves and other malicious individuals. Conceal carry permit holders may like having their firearms around, but it doesn’t mean that they will just carry it everywhere. On occasions where they need to put it away, they’ll need a safe place to hold their valued possession without any risks. This is where the SnapSafe gun safe makes itself very useful. 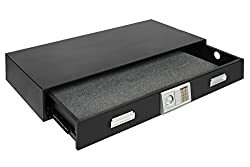 Designed specifically to fit most handguns, the SnapSafe 75220 Key Locked Box for Handguns can be a great pick for a reliable portable gun safe. The biggest draw of this product is that it meets safety standards. It’s even approved to be used to store firearms during air travel by the TSA and a number of airlines. However, it will still be prudent to check with the airline you’re flying with whether they have specific rules for bringing in firearms on their flights. When it comes to air travel, it’s better sure than sorry, so always remember to ask for details. Quality-wise, it guarantees reliability with its use of 18-gauge steel. The material guarantees durability and will withstand heavy use. If you just want a good storage space for your valuables and firearms but don’t really need a heavy-duty safe, then the SnapSafe Modular Gun Cabinet might already do a good job for you. This product is more of just a steel cabinet with a lock instead of an actual gun safe, though, so it’s best to be used as such. Designed to securely hold large firearms with its rifle holder, you can also use this item for various other purposes. The removable shelf can be positioned in other ways, so you can easily tweak your unit without breaking a sweat. Featuring a 20-gauge steel construction, you can expect this unit to be quite heavy duty. While it doesn’t have the fancy features the other SnapSafe products offer, it can still protect your equipment without having to spend much. Its modular design, however, can really make it a good pick for lots of people. You won’t have to worry about lugging an unwieldy steel cabinet with this option and might even do a better job than its alternative. Keep in mind that this product is a straightforward gun cabinet and not a safe. It will lack the essential features safe have, hence the lower price. It has a sturdy key lock, though, so it will still be able to keep out little ones. SnapSafe was created by Edward J. McGunn, a third-generation safe-builder and gun collector. His extensive experience in the field afforded him the knowledge that he needs a secure place to store his guns. It should also be fireproof, just in case. His wide experience in the safe-manufacturing industry made him fully aware just how difficult, unsafe, and expensive, it will be to move a safe from one place to another. Not only is it an impractical undertaking, but most of the time, the safe doesn’t even go to an ideal spot. SnapSafe was born out of the idea that a modular safe would be easier to move from one spot to another. It promises to afford owners a safe way to store their guns and other important items without any hassle. As this brand’s products come in pieces, they’re easier to move and transport. They also quickly assemble together with a comparable quality to welded units. In 2015, the popular security company, Hornady, acquired SnapSafe. Founded in 1949, this brand has already established itself as an authority in the production of ammunition and lots of other security products. Where are SnapSafe Safes Made? One of the only major downsides that SnapSafe has against its competition is that it doesn’t list where it’s made. This can make lots of people doubtful, especially since if it’s made in the US, such information will be plastered everywhere. However, its performance tends to compensate. It has a very sturdy and special construction that’s definitely noteworthy. A lot of people also trust the special lining inside its panels, making a good case for these products. Of course, the first thing why many people give SnapSafe products a shot is its modular design. 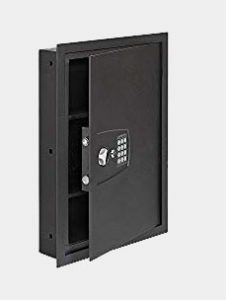 It’s easily more portable than the other reputable safes in the market today because you can take it apart and just snap it together right where you need it to be. 2. Its fireproof claims may not have details, but the construction shows great promise. SnapSafe products have a 2300F Fire Shield protection claim that promises to last for an hour. Lots of people are quite convinced that the claim has its merits because of the units’ construction. 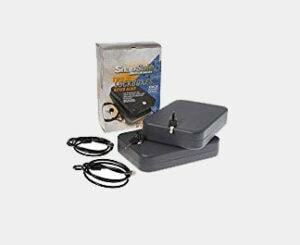 These safes are lined with ceramic fiber materials with magnesium oxide. These make it highly fire resistant. They also have heat activated doors, so the contents are sealed inside to protect them from water and hot air damage. These items are heavy, so if you’re going to pay for shipping costs, you might end up settling for a less than stellar safe that’s locally available. That will be a shame when you already have a good option like a SnapSafe modular safe. I know you must be thinking that SnapSafe products aren’t exactly cheap. Then everything evens out, right? You can just consider the fraction of the item’s price to be the freight costs and you’re good to go. 4. Ships faster than the closest competitor. 5. Still a bit more affordable than other comparable products in its size range. Among the five items in this roundup, we might go for the SnapSafe Under Bed Safe because of its huge capacity and relative flexibility. While it’s not a modular product, it can still be a good pick for many people. The fact alone that it can sit under your bed and safely hold your large guns is a nice way to make your home feel more secure. You can easily access it in case anyone tries to come at you in the middle of the night. Its solid construction makes it an even more attractive option. I also like that it doesn’t require any assembly at all. It might not be as big as a SnapSafe trunk safe, but it will already do on many occasions if you don’t really have a big collection. The brand’s great reputation and promise of great convenience are just a few of the best reasons why SnapSafe products can be a good choice for you. I hope this SnapSafe review helps you get to know this manufacturer better so you can easily decide whether it will be a nice fit for your home.